The Consumers Association of Malawi (CAMA ) has demanded a compensation from New Building Society (NBS) Bank following a system crash that has led suspension of bank transactions. 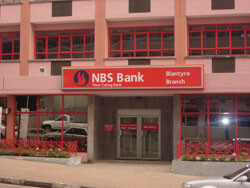 Information that Malawi24 has, indicates that NBS Bank has been failing to serve its customers across the country since last month. In reaction, CAMA executive director John Kapito described the development as an ‘insult’ to customers therefore the bank needs to consider compensating customers. Kapito further condemned the bank for not having alternative systems to serve its customers. “This is rubbish and it is an insult to customers,the bank was supposed to have alternative systems to serve its customers” added Kapito. NBS chief executive director Bernadette Mandoloma said the bank has been using the system since it was established. “For the past years, we have been using the system we were just updating and it was working. Our technical team are to insure that we will not have same problem in future” said Mandoloma. The bank has issued an apology for the inconvenience the problem has caused. Vuto ndi atsogoleli athu,mavuto onsewa nthawi ya Kamuzu zikanawathera bwa?Ufulu uja tinagura ndi ma T shirt ujatu ndizimenezi,atsogoleri athu ali mturo tidikire kaye akadzadzidzimuka! I still love NBS my caring bank, zinangovuta. Mwina nawo ali ndi account ku NBS ko. He wants to be compensated. Koma ngati akungolankhulira ngati executive director wa CAMA ndiye, he is talking zinthu zopanda mutu. Escom & Waterboard why are they not compesating their clients. Just because it is a bank ndiye it should compesate it’s clients??? Oooh!!!!! aCAMA aCAMA y are u against this bank. maybe they didn’t employee ur sons n daughters???? .water hz never compensated it’s customers. Esocm hz a lot of customers to compensate .so chilungamu chichitike and Nbs shud b de last to do so to it’s customers. I quite agree with paul,since its money ur now asking fo compesation!y didn’t u ask waterboard,escom for compesation,Malawians be wise wen making such suggestions this is why we r stll poor,ed blieve me u dea will be no other malawian if we will continue living like this!! Just Exactly What I’d Say Paul.Tell The Idiots. The solution is obvious. Those who are making such noises will be compensated to shut up while customers will be compensated by being ignored. Look at the Mayayas,Mtambos wth their CSOs. Where are they now? Anaaika zimabazi nkamwa pano kuli ziiii ndi zimaphokoso zawo zija. Amalawi koma tili pamavuto.